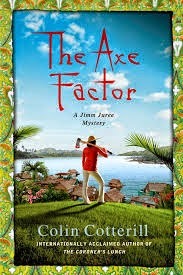 Thai journalist Jimm Juree is back in an all new mystery in the book The Axe Factor by Colin Cotterill. I have enjoyed the previous two mysteries featuring the intrepid reporter and her wacky family, so I was hoping this book wouldn't disappoint. Now that I'm more familiar with the characters, I think I enjoyed this book the most so far. Jimm is a 30-something freelance crime reporter for the Chiang Mai Mail newspaper. She was having something of a successful career in the big city when she was called home to help her mother with the family business, the Gulf Bay Lovely Resort and Restaurant. Unfortunately, the run-down resort is woefully short on paying guests, which is probably a good thing, because the family members running the business all have better things to do. There's the mother, Mair, who spends her time rescuing stray animals and helping others, while early stage dementia makes her a somewhat unreliable source for any information. Brother Arny is a massive body-builder who unfortunately faints at the suggestion of blood, so he's of limited use in a fight. He's engaged to Gaew, a female body-builder who is the same age as his mother. Transgender sister Sissi doesn't live with the family, but the former beauty queen and computer expert is only a phone call away when someone's computer needs to be hacked. Rounding out the regulars is Grandad Jah, a taciturn retired traffic cop. There are also 3 bad tempered dogs and 2 cows who wander about the place at will. In this adventure, Jimm is drawn into the mystery of a missing doctor. While trying to help her mother rescue a kitten, Jimm is severely scratched. When she goes to the clinic for rabies injections, the nurse confides that she believes one of the doctors has met with foul play. The female doctor had been extremely reliable, but she hasn't turned up for work in a while. Jimm begins to ask around, and finds out that Dr. Somluk has a reputation for causing trouble wherever she goes. Recently, she attended a medical conference and made a scene which caused her to be removed from the auditorium. As Jimm investigates further, she begins to wonder if the multi-national company that sponsored the conference might not be involved in the disappearance. At the same time, another woman seems to have gone missing. This woman was the Thai wife of a British author who lives in the area. The author, Conrad Coralbank, is known for writing mystery novels set in the neighboring country of Laos. Jimm is sent out to interview him for the newspaper, and there is an immediate attraction between them. She isn't impressed with him, but when the interview she turns in to her editor is too bland, she has to meet with him again. This leads to something of a romance, although the mystery of the missing wife is always lurking in the background. To add to the confusion, several blog entries (ominously listed as "found two weeks too late") are interspersed throughout the book, indicating that the writer has already killed and has Jimm in the frame as the next victim. But who is the blog's author? As a hurricane approaches, it's up to Jimm and her assorted band of helpers to try to trap the killer and find out where the missing women are. I really enjoyed getting back to the shabby beach again and catching up with Jimm and her family of misfits. The book ended on something of a downer, so it will be interesting to see how they come back after this adventure! I enjoyed the (presumably genuine) signs taken from various places that have mangled English, such as the vending machine that was OUT OF CONTROL.